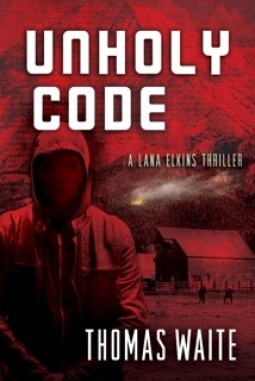 UNHOLY CODE (Lana Elkins #3) by Thomas Waite – Books, Books and More Books! Former NSA agent, Lana Elkins, is back! Still cyber sleuthing trying to keep track of the jihadists, homegrown terrorists and the white supremacists especially the one they call “Steel Fist”, the head of a radical supremacist organization with millions of dedicated crazies following his every word and Anti-Islamic rantings on the internet. His popularity only increases when a group of terrorists are apprehended along the Gulf Coast of Louisiana. Apprehended a bit too easily in Lana’s eyes, something seems a bit off. And it is… for among those apprehended is not a suicide bomber, but something worse. The story is fast paced, thrilling and the scary thing is it is all possible. While our government is hacking and spying on possible terrorists at home and abroad, those cyber skills aren’t limited to the government. Everything and Everyone can be hacked, spied on and not everyone is using this technology to do nice things. This book has everything, cyber-crimes, ISIS, Al Quaeda, the White Supremacists and no one has a clue who is really behind it all or why it is happening. Lana will have to be smarter and fight harder than ever before. Will she make it out of this one alive? Mr. Waite never disappoints, his books always leave me on the edge of my seat and not wanting to get up! I highly recommend this book and can’t wait to see what is next. Thomas Waite is the bestselling author of the Lana Elkins thrillers Lethal Code, Trident Code, and Unholy Code (summer 2016). His debut novel was Terminal Value. Tom was born in the seaside town of Ipswich, Massachusetts, once home to the authors John Updike, Adele Robertson, John Norton, and the poet Anne Bradstreet. Updike was a patient of Tom’s Dad, which enabled him to build a nice collection of signed first edition novels. Perhaps it was the history of the town, but from an early age Tom developed a love of writing and left Ipswich to earn his degree in English Literature at the University of Wisconsin-Madison. There he focused on creative writing and was selected by the English Department to participate in an international study program at the University of Oxford. Tom’s debut novel, TERMINAL VALUE, reached #1 at Amazon and was critically praised (one critic wrote “I believe with time he will become the John Grisham of the murderous technology novels.”). The first two books are on my to read list, good to know the story continues! Hi Piratepatty, you are lovely so I nominated you for the Lovely Blogger Award. Hope you accept it in appreciation of you.